The world of Ogre is the story of the Last War . . . the world war between the Combine, Paneurope, China and Nihon . . . and the time after the death of the empires. The Ogres begin as mindless killing machines spawned in the labs of the Combine, and end as self-aware free agents and mercenaries, the metal warriors who keep the balance of power between the Factory States. In between lies a century of mayhem. Ogre: Objective 218 – Available Now – click here to order! Ogre Classic Counters – Warehouse 23 Only! – click here to order! Available for both PC and Mac. 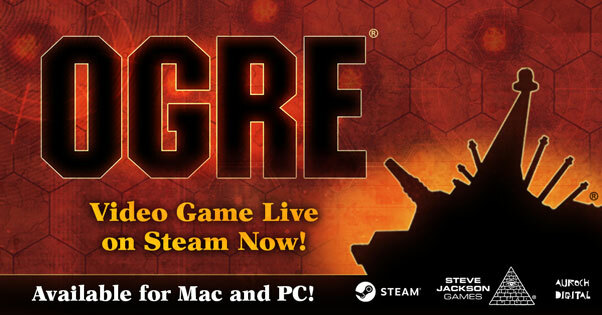 Ogre Video Game – Available on Steam! 1/285 scale miniatures, with an award-winning rules set. Ogre Miniatures – Always available – click here to order! This book won the Origins Award for Best Miniatures Rules of 1992. Available for FREE in PDF! Black Ogres – click here to order! Ogrethulhu – On hold . . . but it cannot die! Ogre Scenario Book 1 – Always Available – click here to order! Ogre Scenario Book 2 – Always Available – click here to order! Ogre Scenario Book 3 – Always Available – click here to order! The Ogre Book – Always Available – click here to order! Ogre War Room – Available for Free! Ogre Suite Digital Album – Available at Bandcamp! Shockwave – PDF Available – click here to order! Ogre Reinforcement Pack – PDF Available – click here to order! Ogre Battlefields – PDF Available – click here to order! Play a GEV pilot, a militiaman, a survivor . . . or an Ogre! GURPS Ogre – Available Now – click here to order! Posters and, well, other stuff for the Ogre fan. Get yourself a few Ogre Shirts to wear! Ogre Blueprint Poster – click here to order! Red/Blue – click here to order! Black/Green – click here to order! Ogre Lapel Pin Set – click here to order! Ogre Combine Shot Glass – click here to order!